Yes, really. If they didn’t exist, we wouldn’t be so busy. One, Vatican standard operating procedure is to NOT say things, and NOT say them very loudly. The Vatican likes doing things by not saying them. It’s a bad habit I grant you, but part of the way of doing things. You don’t condemn the IRA, because they just change their name. But when JPII goes to Ireland and condemns “Men of Violence.” you get the idea. When Pius XII condemned racists, treaty violators, and dictators within weeks of the Nazis invading Poland, even the NYTimes got the idea. When Pope Francis Visits nuns suing Obama the same day he talks about religious liberty, people are supposed to get the idea. And, really, how many of the feminazis would use a Papal condemnation as a sign that “We’re doing it right! Yay!” Come on, they already go to rallies chanting Hail Satan. So he says respect life at all stages. Number Two: Who says that the Pope didn’t say what you wanted him to? For instance? The Pope had a virtual town hall in which he declared abortion as murder and killing children. If you only read Time Magazine, you’d never know he said anything about it. The way the media reports it, you’d think that Nancy Pelosi is actually a Catholic. She’s been denied communion for years now. “I want Francis to declare that he’s not a communist!” Will you take him at his word if he says he’s not a Leftie? Number Three: Does the Pope really need to say it? Does the Pope have to say that the church is against abortion? Honestly? Are you kidding me? Does the Pope have to say that the church is against communism and against fascism? Because there are encyclicals against them already, and he hasn’t revoked them. But surely Pope Francis must speak out against them, because how else will we know he’s against them if he doesn’t? Seriously, how stupid do you have to be? The Pope said in his speech before congress, show tolerance towards immigrants. Does he HAVE TO SAY that you’re obliged to let them run rampant and lawless in your country? Because he DID NOT SAY THAT, some nimrods have broken out their decoder rings and found THE POPE’S FOR ILLEGAL IMMIGRATION! HE’S JUST LIKE OBAMA! So if the Bishop of Rome doesn’t specifically say that he’s not a fan of My Little Pony, that makes him a fan of My Little Pony? ….For that matter, if someone whose every effort was to attack Christians, and that person said he was a Christian, would you assume everything was fine? Just checking for consistency on that “fruits of their labors” standard. Because somehow tolerance and compassion means lawless rampage and breaking laws. Huh? In short: stop it. Stop reading into things, stop looking for hidden messages with the decoder rings. Seriously, just stop. To those who genuinely don’t know: The Catholic Geeks are here. We’re not going anywhere. Ask us something. We’ve got a Facebook page. We’ve got Facebook groups. We’ve got people who are willing to talk until they’re blue in the face, and that STILL won’t stop some of us. To those who lie, because you’re anti-Catholic or because you want to get something out of it: The Catholic Geeks are here. We will hear about you. Then we will find you and publicly beat you over the head with facts and figures and history. Then we will make fun of you for thinking you can get away with it. Then, if you want it, we’ll forgive you, give you a handshake, say “Nice fight,” and see you next Tuesday. Because we’re Catholic, that’s what we do. Sorry, no, we won’t be siccing Vatican Ninjas on you, because those are fiction, no matter what Dan Brown says. This entry was posted in Commentary, Rants, The Church and tagged Pope, Pope Francis, Pope Francis Visits, Strawpope Frank, Vatican. Bookmark the permalink. This would be a lot easier to get across if more people didn’t filter their entire worldview through politics. What I don’t want is people refusing to take a stand unless it’s to oppose someone else. What that leads to is defining a permanent “us versus them” state, which prevents any agreement. I agree with liberals on a lot of the things they say: I want to defend women’s rights, and blacks’ rights; I want to defend gay rights, I want to not pollute, I want to provide for the poor, I want everyone to have good medical care. I just disagree with how they do it. I want to support everyone, regardless of internal plumbing or external color. I want the right to practice my religion free of government control. I don’t think that the climate change issue is as big as the Pope seems to think, but I certainly don’t disagree with him on the idea of stewardship. I want to encourage people to do things they ought to do, not mandate that they do them through no choice at all. If you just read that list of things I like, I sound like a liberal statist, because that’s what the liberal statists want too. But that doesn’t work with the next paragraph. 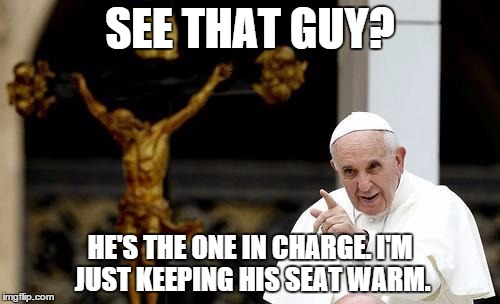 And that is where the issue with the Pope comes in. People on both sides of the political divide are cherry-picking what he says.